Onions Australia represents the biosecurity interests of onion producers and the industry. In 2015–16, onion production was valued at $184 million (LVP). The main growing areas for onion production include the Lockyer Valley, St George and Darling Downs in Queensland; Murrumbidgee Irrigation Area in NSW; Adelaide Plains, Riverland and south eastern SA; Manjimup and Pemberton in WA; Werribee and Cranbourne in Victoria; and the north western to northern midlands of Tasmania. Sowing of onions starts during February (short day types) in Queensland and finishes in September (long day types) in the southern states. Harvest starts in Queensland during September and finishes during April in the southern states. 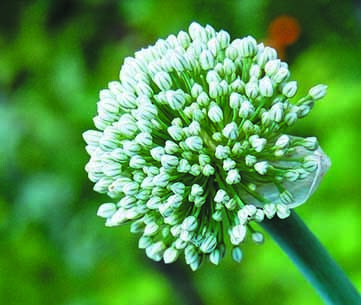 Onion (Allium cepa) flowers consist of a spherical umbel made of florets that are less than 5 mm in length. 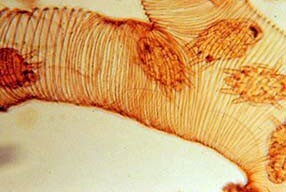 The florets have six stamens, a single style and an ovary with two ovules. It takes about two weeks for all the florets on an umbel to open completely. Most of the pollen is made available on the first day and the remainder on the second day. The pollen is shed before the stigma becomes receptive. Pollen viability declines quickly after the floret opens. The stigma of a flower may still be viable for up to 6 days after it opens. The flowers are self-fertile so pollen from one floret can pollinate another floret on the same umbel. Where male-sterile lines are used for seed production, pollen must be moved between umbels for pollination. The flowers are visited by a range of insects that collect pollen and nectar. 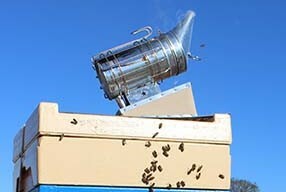 They produce enough nectar that beekeepers can occasionally collect a honey crop if large enough areas are planted. Flies have been used for pollination of onions in breeding trials but for commercial production of onions, honey bees are usually the only option. 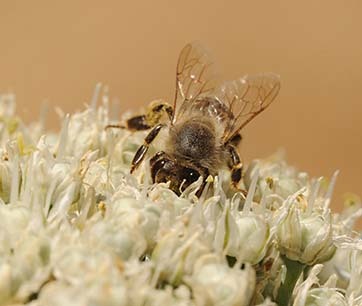 Honey bees will visit onion flowers to collect both nectar and pollen, but only nectar foragers will visit both male-sterile and male-fertile lines in hybrid onion production. Onion nectar is not particularly attractive to honey bees. The sugar concentration of the nectar has been reported to increase if potassium fertiliser is added. However, high amounts of potassium in nectar have been suggested to be the reason why onion nectar is not particularly attractive to honey bees. 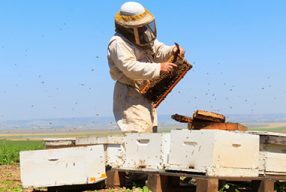 Bees have a tendency to move up and down rows instead of crossing between male-fertile and male-sterile varieties, which probably reduce pollination. They also tend to find male-fertile lines more attractive than male-sterile lines. 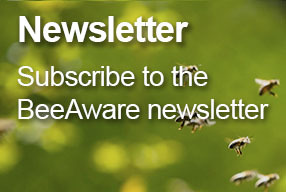 Because only bees foraging for nectar will visit both male-fertile and male-sterile lines, colonies introduced to onion fields should have large numbers of adult bees and should not be fitted with pollen traps or be fed with sugar syrup, as both these methods promote pollen collection at the expense of nectar foraging. Usually bees do not find onions very attractive and they can be easily drawn away from them to other surrounding crops. For this reason, high colony stocking rates are recommended. 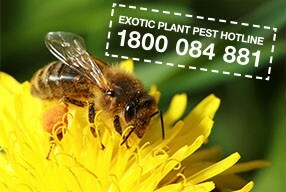 Rates in excess of 30 hives per hectare have been suggested.